Unfortunately every time I looked at the pizza oven, it conjured up memories of the bubonic plague, a.k.a. the Black Death! Luckily I have one of those bodies that forgets very easily. Proof is in not one kid, but two! the plague was merely a faint memory. This is the only dish that turns out every time! Chimney is complete with a cap built from the bottom of a keg. We had to burn the interior form out of the oven, which was pretty fierce. HOLY CRAP call the freakin fire department. Check out the fire department on the right and left side of the oven. My Hero Gnomes! Mr FT put his fancy chef hat on and started cooking up a storm. Our first pizza was somewhat of a failure, as was pizza number two and three. Maybe even pizza four. Luckily I forgot to take pictures of our failures. Actually, I lied...I documented every one of our failures but Mr. FT blabbed like a mad man through the video, hamming it up, (what a fame whore), so I deleted them. Okay that's not true either cuz I totally would have shared that with you. hehe Let's just say they weren't internet worthy plus we swore a little. A SHORT pizza video for you....this one was just cheese and sauce but it was delicious! 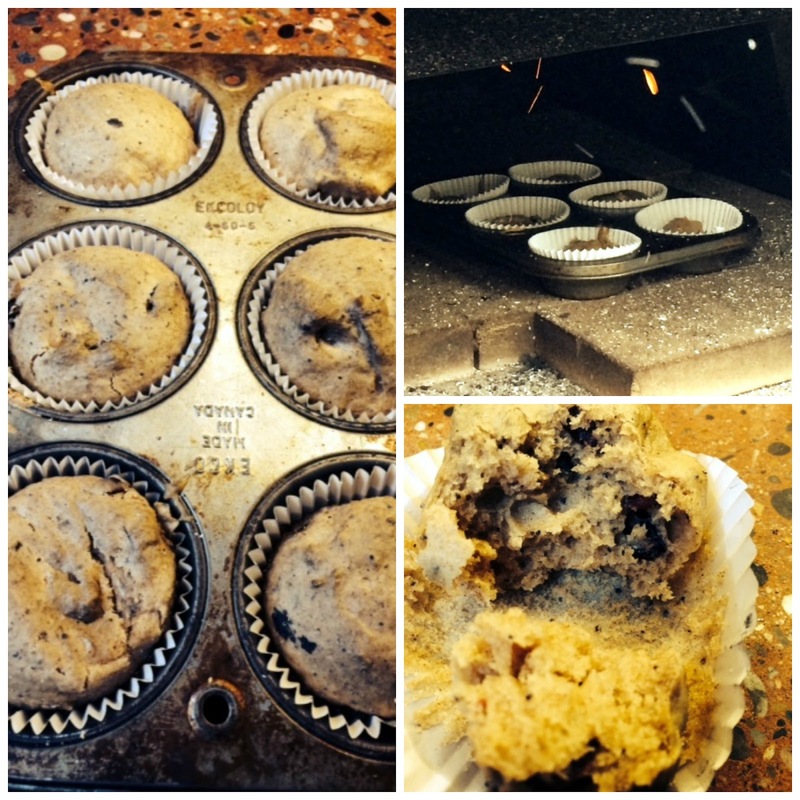 And some muffins...not so good in the pizza oven but the ones I baked in the regular oven were YUMMY. Thanks Magali for the recipe! You can find it here at her blog: The Little White House on the Seaside. PS We ate the failed ones from the pizza oven anyways. They tasted that good Magali! We also whipped up a batch of buns for a trial run.....They were eaten before the end of the day. Somebody needs to get on the treadmill. Roxul Insulation was secured around the rocket stove. We wrapped that baby up tight. The base of the outdoor oven was covered with cement board. Not being able to bare the thought of laying more rocks (bubonic plague memories), we've decided to break up the expansive area with some sort of tiles. Any suggestions? I'll be going on a five kilometer run today.......thanks to our new outdoor oven! Look out couch, here I come! Wow! What an oven Karen! Very impressive! We eat all oven failures too. Especially if it had sugar in it. I think tiles would look good to finish. Can you bake chicken or a turkey in it? That is some amazing oven, Karen! The shape is very similar to the one our son built, but he added a grilling area on the side & had an open area underneath for wood -- the packrats loved stashing their treasures in there! Now REST! Holy smokes! And I mean, holy smokes! That is one wild fire. You should have put the swearing videos on, haha I would have enjoyed them. You should put some gorgeous tiles on your pizza oven, that would be lovely. Your pizza oven looks awesome! I was wondering how you were going to get rid of the wooden mold on the inside. I guess that's the only way to do it. I can't even imagine building such a thing. Way to go! We're having pizza tonight for our third Thanksgiving dinner, but the regular oven kind of course. We've had enough turkey. I love me some pizza!! HappyThanksgiving. I'm shaking my head in disbelief. At pretty much the whole thing. I'm impressively amazed! That pizza looked awesome. #5 will be better yet. But you know what the BEST ONE WILL BE??? I feel short changed. I wanted the videos with cussing and failure! And that last pizza? Looked divine, but I also wanted to hear all the "num num" noises. Rats. Foiled again. Burnt food and profanities always make for hilarious blog posts ;) You have me jonesing for some greasy pizza oven pizza now! And some muffins. And I wanted to wish you a Happy (belated) Thanksgiving! If you do cook a turkey in it, fail or not, be sure to come back and tell us how it went! 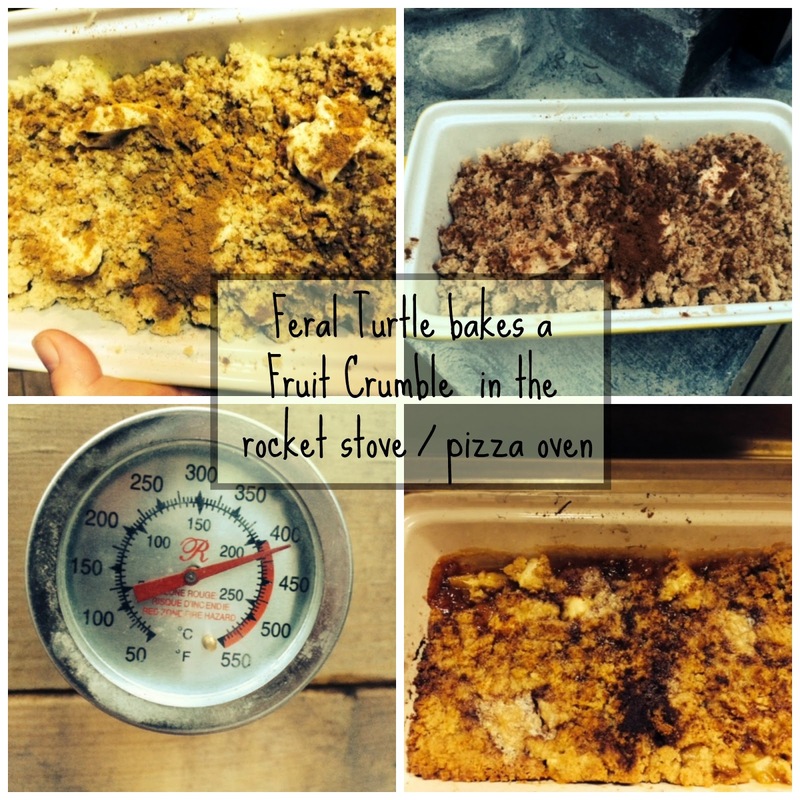 I still say you need to put together a rocket stove pizza oven recipe e-book. I can't imagine anything coming out of that oven and NOT tasting good. Between looking at Danni's fruit crumble, Magali's muffins and your pizza, I need to go run the 5K. I hope you all had a wonderful Turkey Day!! wow wow wow, so AWESOME!!!! I wish I had seen Mr FT hamming it up though that would have been cool. 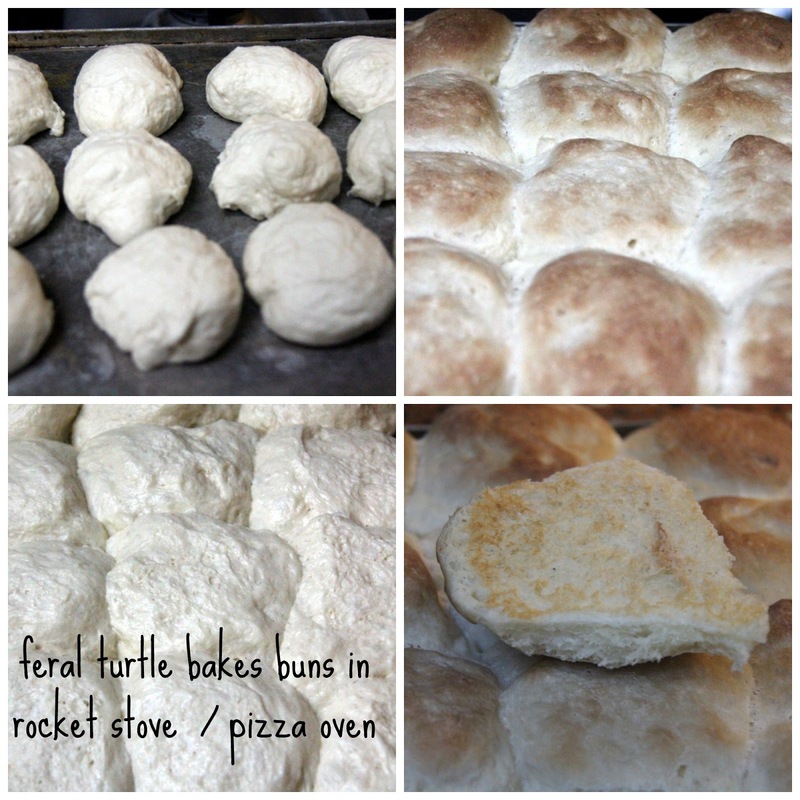 I am so impressed by the bread rolls that oven is amazing, I WANT ONE!!!!! I just wanna go wake Sam up and show him this right now! So cool! I know he's going to want one and I'm guessing it will be on the spring project list. I can't believe we didn't get to see you guys in the video! Next time? So, will the winter temps affect the cooking time and all? I think you should maybe do some kind of mosaic with a turtle on the base. I'm glad you are enjoying my crumble recipe and it's healing abilities. Now I need to check out those muffins and I'm hoping you are going to share your bun recipe with us because they look yummy! Thanks for the shout-out girl! Oh, you made muffins in the pizza oven? You're so brave! I love the look of the rocks on the oven, though I understand you want something simpler at the base! Thank you so much for mentionning my recipe. Such a fun post, I love the way you write! The oven turned out great, I'm sure when you get the hang of it, LOL you'll have some great meals! Your hubby has some serious testosterone going on Karen! That fire scared the qwap out of me! I vote for tile. Maybe a mosaic? Whatever you decide, it's going to be awesome! I came over to see how the pizza oven was going and got distracted with your cute halloween decorations in another post, ha! Anyways, this is looking awesome. The pizza video great, it looked so good! Have you figured out the tile? Maybe slate? The whole oven concept from start to finish is so impressive!